Reflections on post-electoral politics in Italy. With no clear winner emerging out of the election, a new era of uncertainty opens for Italian politics. How can the country get out of the post-electoral impasse? Italy is facing a period of turbulence without parallel in its post-war history writes Carlo Ungaro the former Italian diplomat. Italians woke up on the morning of Tuesday, 26 February with the realisation that not one of the numerous opinion polls was correct in predicting the outcome of the elections held between Sunday and Monday, and that the country was probably facing a period of turbulence without parallel in its post-war history. In 1948 all the opinion polls published in the United States had assured Americans that President Truman could not possibly win the presidential elections. Truman responded by stating that the opinion polls were “eyewash” and proceeded to win, rather comfortably. In his Genovese dialect, Beppe Grillo, the undisputed winner of these elections, is probably echoing the same thought. There are many amazing results from this electoral exercise, amazing even in a land of paradoxes such as Italy, the most notable being the fact that the ostensible “winner” (i.e. the coalition that has the largest number of elected officials in Parliament, the “Democratic Party” and its allies) is, in reality, one of the principal losers, having gained the smallest percentage of the total vote in its history, and finding itself in a position which will make it well nigh impossible to govern according to its electoral commitments. These elections have, in fact, produced only one indisputable winner, the unpredictable maverick “Five Stars Movement” created and headed by former comedian Beppe Grillo. This populist to the extreme movement, which has refused all financial aid and has never appeared on the many Television programmes much favoured by its rivals, ended up taking around 25 percent of the popular vote, making it the largest single Party represented in Parliament. Another surprise “winner” is Silvio Berlusconi, the much reviled former Prime Minister who also ran on an incredibly naïve populist campaign, and who, after having been virtually written off both by Italian and foreign observers, has almost pulled one of his miraculous comebacks, with his coalition losing out to the centre left by only a handful of votes. Berlusconi, however, can also be termed a “loser” if his results are compared to those he obtained in the past. But the biggest loser is without doubt outgoing Prime Minister Mario Monti, who entered the political fray against the advice of many, including an astute veteran political figure such as the President of the Republic, Giorgio Napolitano, a former Communist octogenarian who has been active in Italian politics for all of his adult existence. It is said that he advised Monti to play the role of Cincinnatus, and to let the active political parties and coalitions tear each other apart in what promised to be a very intense battle, with the possibility of emerging, once again, as a possible solution to the country’s instability. Instead, Monti was convinced that his “centrist” movement would get enough votes to guarantee him a fundamental role in the post-electoral political spectrum. In reality, at 10 percent, the coalition just barely scraped through to collect the minimum number of votes needed to get into Parliament. Having said this, two questions arise: first, we need to figure out the reasons behind such an unpredictable outcome, and second, whether there is any hope of forming a reasonably stable government in the next weeks (or months). The situation is complicated by the fact that president Napolitano, finding himself in the last six months of his mandate, does not have the Constitutional power to dissolve the parliament, and it would therefore be difficult to return to a new electoral process before the nomination of the next president in a joint session of Parliament and other institutional figures. These fundamental queries can be approached only after an analysis of the winning movement’s power of attraction to people of various age groups and former political allegiance. In European politics the term “populist” can be misleading, and brings to mind some extreme right-wing movements, bordering on the neo-fascist, which exist elsewhere. Grillo refuses to be cast in a “right wing” or “left wing” role, and, in fact, his basic ideas are slightly more to the left of centre, without, however, allowing the conservative parties to raise the spectre of Communism. Even his anti-European stance is not really that absolute, and is rather a criticism of the heavy handed nature of EU interference than a desire to quit the eurozone or the Union itself. His common sense approach seems to attract voters: everyone, for example, has been claiming that elected politicians are overpaid, but no attempt has been made to remedy the situation. Grillo’s elected officials have voluntarily docked their own pay, and this has scored many points in his favour. The feeling is that the electorate wanted to punish the two most powerful political coalitions – Berlusconi’s to the right and Bersani’s to the left – for their inactivity during the thirteen months of Monti’s “Technical Government”, a period which could have been dedicated to the carving out of essential systemic reforms and was instead spent in totally vacuous political posturing and sparring. The way the electoral campaign was conducted is also indicative of the vast difference in approach between Grillo and his adversaries. 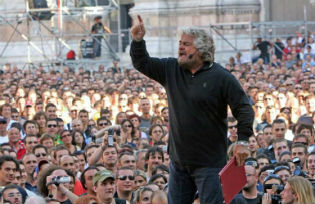 While the traditional parties campaigned almost exclusively on Television, as guests in the many available “talk-shows”, Grillo undertook what he called a “tsunami tour” of the entire country, with no barriers between himself and the people, and was seen addressing ever larger crowds which turned out in all weather conditions and kept showing undiminished enthusiasm. Still, the present situation appears almost hopeless: the writer of these notes has been following Italian politics since 1948, and does not recall a state of comparable confusion. The left has a comfortable majority in the Lower House of Parliament, but the Senate is totally deadlocked. Italy is very dissimilar to Germany, and the idea of a “Grand Coalition” for the sake of stability and progress would be unlikely to function, since it would have to bring together two factions that have been at loggerheads for the past two decades. The Democratic Party could court Grillo and ask his movement to join forces, but Grillo is unlikely to fall for the usual siren song (a few ministerial positions in the future government) at the risk of being trapped in the quagmire of Italian politics and losing his popular momentum. If he does collaborate, it will be at a price, and this price may not appear acceptable to all the components of the majority coalition, which could end by splitting up. The justified fear is that, as has happened in the past, diverse groups will glue together a clumsy, unworkable governing coalition which will stagger through the coming months, unable to complete the reforms initiated by the Monti administration. This could well end up in disaster. The question remains open, and only the next few days will give an indication of what the outcome could turn out to be.